As most readers will know, the 40gr airmail NVIs are being replaced by these 20gr stamps which, like the earlier ones and the airmail postcard NVI, are sold in booklets of 4. Most collectors will also know that Royal Mail made the 40gr and postcard stamps available, not only to dealers but to collectors, as singles. At least until 2008 (maybe later, but not now) the 40gr and postcard airmail NVIs issued in 2003/4 were sold from Tallents House as product codes US001 (40gr set) and US002 (postcard). 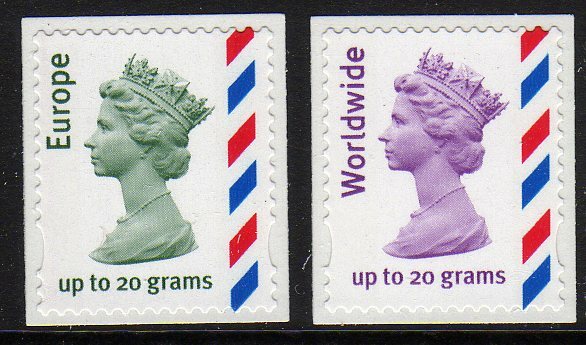 The point of this was that collectors who only wanted one example of each stamp and had no use for the other three in the booklet, could obtain singles without incurring undue expense. - buy from dealers at a premium over face. So there you have it. Personnel change, policies change. They want you to buy stamps, and to do so you will buy more than you want, or be forced to pay the excess for the presenation pack. Meanwhile at the London Festival of Stamps, they will be selling pre-packaged cylinder blocks, gutter pairs, etc, of some issues. Think about why - it's only so that the queues don't get too long. But the queues of people wanting one of each definitive but not a presentation pack will be lengthened as the Royal Mail people explain for the nth time why they can't sell single 20gr airmail stamps. Thanks for the info. Of course most of us loyal buyers of Royal Mail stamps have already purchased the other stamps in the presentation pack and I, as a collector of single stamps living in the U.S., have no use for the extra three stamps. Should I send them to Her Majesty for a refund? When I get to it, I'll be listing these on our online store (www.norphil.co.uk/catalog) where we also have listed all the new Machin overprints (up to 13 May). I too, collect single stamps of all Machin definitive stamps from GB. May be the solution is four of us, collectors of similar discipline get together and buy the booklet and split it. Suppose we don’t find enough of us to buy the complete booklet, may be I can buy the rest. There are enough members from my Machin Study Group, I think, willing to buy them from me. If a group of collectors can get together it will certainly be cheaper than buying from a dealer. But remember, these are valid for any item of mail. The Europe 20gr is 68p - add 7p and you have the basic cost of an inland 1st class Large Letter. The Worldwide 20gr is £1.10 - 1p more than the price of a large letter 100-250gr. And if you sell on eBay, or send birthday or Christmas presents..... or send internationally, keep them and use them later.